Finally I have managed to get my internet up and running again and after a few days of absence there has been a lot that has happened in the World of Italian and European Football. First of all Inter followed in their usuall ways as they got knocked out of the Champions League by last year's finalists, Liverpool. The Nerazzurri had to overturn a 2-0 deficit to proceed to the next round. Nicholas Burdisso got sent off after too yellow cards to end the Italian Champions hopes as they went down 1-0 to a fantastic Fernando Torres strike, making Liverpool the second English team to win at the San Siro in a week. Following Inter's exit, Roberto Mancini declared that at the end of the season he would be leaving Inter, and that his decision had nothing to do with Inter 's loss. However a day later Massimo Moratti had a good heart-to-heart chat with his team's tactician which resulted in a total U-Turn. It's just one big chaotic story on the nerazzurri end. While Inter continued to procrastinate about Mancini's feature Fiorentina were celebrating as they managed to beat Everton on penalties to see them through to the quarter final stages of the UEFA Cup. Fiorentina had previously beaten Everton 2-0 at the Artemio Franchi but fell 2-0 down when it came to the away leg. 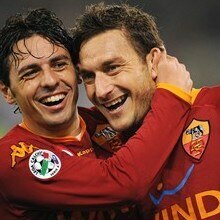 They, however, did beat Everton 4-2 on penalties to seal the deal for Prandelli's men. A hearty Congratulations to La Viola!! With one Italian team left in the Champions League and one in the UEFA Cup, all eyes were focussed on who they were to draw in their respective competitions. Roma will once again meet Manchester United, it will be the second time the two teams have met this season, not to mention Roma fell 7-1 to Manchester United at this stage of the competition last year. Fiorentina also have a tough challenge as they will meet dutch heavy-weights PSV. It will be tough for both Italian teams but determination is one factor that both these teams have which will hopefully see them progress into the semi-finals. GOOD LUCK TO BOTH TEAMS! !